CLUTTER MUSIC is a concentrated collection of music from various bands and projects on the clutter corner site. above are the bands included in clutter music and below is the list of songs. click on any 'play this song' link and it will launch the radio player. from there you can stream all of the music in the radio player from a separate little window. when you play a song by a certain band, a link button appears to visit their website. this is recommended because not all songs on the clutter corner are included in the radio player, and more may be on a band's website. music is added frequently, subscribe to clutter music rss feeds by clicking here. tune in and happy listening. a Ghostlady song off the album ‘when the sheet hits the fan’, recorded early spring of 2008 by dave niles; released May 2009. renee bertsch hytinen on farfisa, guitar and vocals, allison stanley on drums, bells and vocals. title track from our 7 inch ep vinyl record ‘meet me in iceland’. recorded in may, 2005 at the 3030 church space in chicago. paul giallorenzo on analog synth loops and wurlitzer. allison stanley on drums and vocals. jason stein on bass clarinet. fred lonberg-holm on cello. recorded at a live show at Elastic in Chicago, summer 2007. stephen favazza on guitar and loops, allison stanley on drums and vocals. this song tells the story of an old gentleman sharing the memory of his wife with his parakeet. recorded as a live soundtrack to 16mm found footage films, and 8mm films shot by us, at the 3030 church space in humboldt park, chicago, 2002. we all sountracked a different character or element in the films. paul giallorenzo on wurlitzer and analog synth, steven tod on standup bass, allison stanley on drums. this piece was recorded in may, 2002, with renee bertsch on piano, alison chesley on cello, steven tod on bass, peter rosenbloom on violin, allison stanley on drums, bells and voice. we recorded in the sanctuary of the pilgrim baptist church, a south side chicago architectural landmark, by louis sullivan. the church burned to the ground in january of 2006.
recorded by sean in ann arbor in summer 2008. sean patrick on guitar, chuck sipperley on guitar, allison stanley on drums. this was recorded early 2007, between ann arbor and new york, as the launch of an ftp based project. Chad Oliveiri sampled the gameboy, Allison Stanley recorded the bass as amplified through the stereo. Recorded at 3030 church space, chicago, in Summer 2005. Paul Giallorenzo on analog synth, Ed Reardon on moog, hanah jon taylor on flute, allison stanley on clarinet, vincent davis on drums. 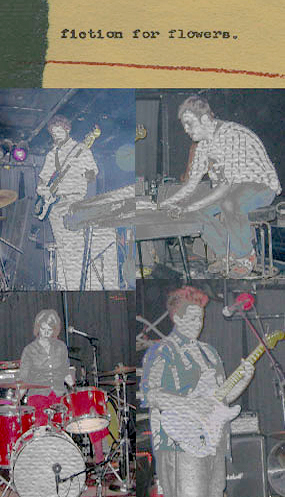 the archivists are a band that existed in the unseasonably hot summer and autumn of 2005, in chicago. one record called ‘paper show’ was recorded on an 8 track reel to reel with dirty tape. this song, the last track, overdrives and statics and represents the energetic and totally chaotic trainwreck that was the archivists. the image is a collage from the one live show played, at the subterranean in chicago, for the tense forms second annual summer art and music showcase. enlarge the image. angela fisher on guitar, cornet, and vocals, stephen favazza on electric piano and guitar, domenico ferri on bass, allison stanley on drums, clarinet, vocals.